Holy guacamole. 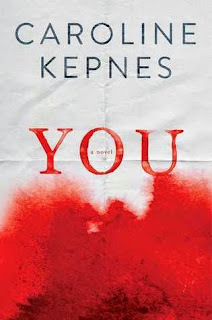 YOU is a really intense read, and not a genre I typically find myself gravitating towards. This book is not for everyone and it's one you'll either love or hate. YOU is a story about Joe, a bookseller that is an obsessive stalker that finds himself fascinated by a woman that walks into his bookshop one morning. He manages to find out more about her and this begins the crazy journey. He starts by standing outside her apartment to watch her and learn more about her. It escalates to breaking into her apartment, and then finally inching his way into her life. Beck is a college student that is an aspiring writer. When she is saved one night by a mysterious man that she later realizes she met at a bookshop she starts to slowly let him into her life. They move from friendship to a relationship all without her knowing that Joe has stolen her cell phone and is reading all her texts and emails. This puts him a step ahead of her, and gives him an advantage since he knows exactly what she's saying to her friends about him and what she wants. I never thought I'd enjoy a book about a crazy stalker guy, but man this book was so well written that you just keep turning the pages to see what would happen next. It was hard to put down and I think I wound up reading this within 24 hours. I heard a sample of the audio from a fellow blogger and oh my gosh, the narrator really channeled Joe's character. I will be getting the audio of the next book when it is released. I suggest this if you're looking for an intense thriller/suspense. I don't think I've ever read a book like that but I'm curious now. I didn't know about it either in fact but I'm glad you enjoyed it. The topic is quite different. Dang it! I've had this one sitting on my review pile for...months. And everyone seems to love it. I'm gonna have to find the time to go back and pick it up.